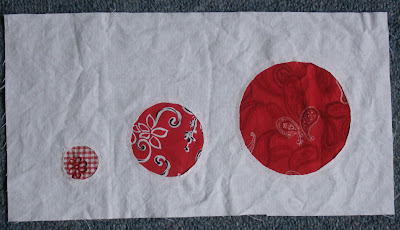 The latest block I've completed in the Something New sampler quilt is all about reverse applique. The applique shapes are stitched on from the back, which means that the bobbin thread is what shows on the right side. So bobbin tension must be set to perfect, and it's not a good idea to have threads poking through where they shouldn't. I'm not too worried about that though, because I'm sure it'll fix itself during the quilting phase. It looks more complicated to do than it actually is. I kept putting off sewing this one for a long time. And then I read through the tutorial instructions, and thought, "Oh that's not tricky at all. It's easy. I can do that..."
And so I did it. And it was easy. Not tricky at all. Iron projects before photographing them!